We have spent a lot of hours with the Singxer SU-1 and recommend this product to many of our customers. It pairs well with most any dac! This SU-1 also has proven to bring the most out whatever dac you choose to pair with it. Recently we have been modding the SU-1 to improve the power supply. We have a KTE edition we have been working on and a few prototypes approx 3uV and 125db PSRR. Also in the process having had upgrading the caps on the main board and the psu board. Pure silver wire is used for hookup wire, an upgraded fuse, pure copper Kitsune Badging, and these KTE editions will come with an **optional ultra premium HDMi i2s cable (Supra HD5 0.5M HDMi i2s cable). So far we are very pleased with the results. Below are some photos of the KTE SU-1 and we are gauging the interest for these as a product we would offer. Please contact us for any specifics or if you’d like to place a pre-order. Complete installation modding service on a new SU1 with all components and labor included. HDMi cable is optional extra. Upgrades are available if you own the SU1 and purchased from KitsuneHiFi originally. The cost is between 330-380usd plus shipping cost to and from (price varies if you choose High Retention USB connector or none. Please contact us if you’re interested. Excellent components have been chosen for the SU1 KTE. New photos will be updated soon to show current components in use. They are different than photos and improved design since these photos were taken. KitsuneHifi aka HoloAudio USA brings you a new product that will excite your senses! Kitsune HiFi carefully chooses products that we want to offer to our customers and be unique and/or stand out from all these audio supply stores. We have recently been talked with a very talented engineer that is the brains behind Holo Audio. Jeff Zhu is the man behind the curtain and has impressed us with his knowledge and his newest line of products he offers. The Spring DAC is his newest product and is capable of DSD native on an R2R DAC! This spring is capable of DSD512 native and actually running on his bespoke discrete ladder DAC! This unique DAC is not your run of the mill DAC, it’s full of unique and well thought out designs and implementations. Patented R2R technology. This is the first discrete DAC that has linear compensation and this allows for ultimate music reproduction accuracy. Dual R2R network for PCM, and Dual R2R network for DSD! We will be offering the first Spring DAC’s in the USA and the Level 3/Kitsune Tuned edition is Exclusive to us. We won’t stock more than a few at a time, and the wait time is usually a few weeks. You may be asking… well what is so special about this DAC? The first Discrete R2R dac with Linear compensation…what is this? There’s an additional R2R ladder in the Spring, it compensates the main R2R ladder. It works like trimming, but trimming is to change the resistor value. This additional R2R ladder is digitally controlled and will accurately compensate the resistor tolerance. For example, the msb of 16 bits should have the value of 32768, but due to tolerance, it represents 32700 in real world results. Then that additional R2R ladder will compensate 68 into it. Thus it now becomes 32700+68=32768. What this means is that it’s likely the most precise Discrete dac on the market with near flawless linearity, lowest THD and highest SNR of any NOS Dac. The sound is simply something you must experience to fully realize how special this dac is. It’s a patented technology exclusive to HoloAudio. This new DAC.”Spring” is the first design of a new era, a milestone for HOLO Audio’s own Jeff Zhu. It’s a full discrete R2R type of audio decoder and does not have off the shelf-DAC chip! This is a bespoke custom-designed core DAC module and truly a breakthrough with technology for any DAC chip today. The Spring is here to achieve new heights, new dynamics and simply a full spectrum of audio to please the aural senses. HOLO Spring “Kitsune Tuned Edition” – LEVEL 3 and exclusive to Kitsune. We offer a transformer upgrade to the highest grade available. The O-core 100VA red label is replaced with a 100VA O-Core green label. Price is significantly more due to the OCC Silver Primary and OCC silver secondary wire used in this transformer. The sound improvement is not subtle, it’s a night and day improvement in our opinion and many of our customers agree. 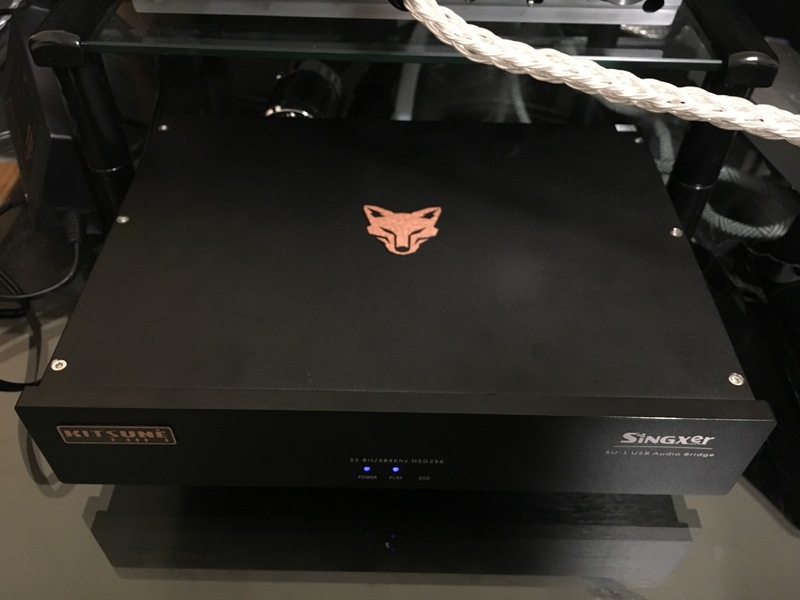 Kitsune has tuned this Spring DAC. We are very proud to offer this Model that is installed from the factory who manufactures the transformers for HOLO Audio. This transformer is our finest available model and makes the Spring’s sound quite elegant and improved detail. All digital input interface supports DSD (DOP mode). Analog Output interface: single-ended, balanced. Modern and popular delta-sigma type DAC differs from R2R within one clock analog value can recover a sampling point, and the delta-sigma is used to represent an analog signal after passing through oversampling and high-speed digital switching 0 and 1 . In comparison, the conversion structure of R2R is most direct and pure, but delta-sigma is essentially a digital chip, high-speed digital signals 0 and 1 switch to the low-pass filter to process the analog signal and this process is prone to various problems, produce digital sound (digititus) and also in the super-sampling process will inevitably cause some ringing and distortion. But DAC R2R structure requires high-precision resistor network which the cost can be very expensive. And the digital delta-sigma DAC chip in comparison is very low cost. Patented R2R technology. 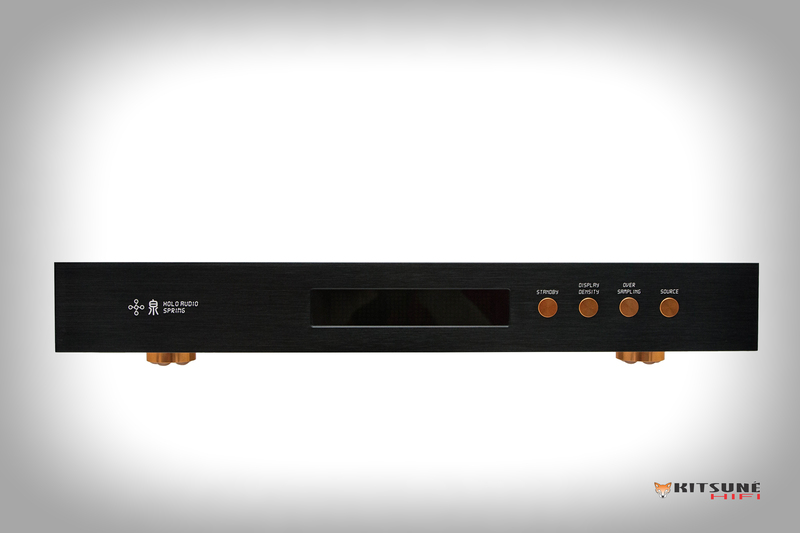 This is the first discrete dac that has Linear compensation and this allows for ultimate music reproduction accuracy. Dual R2R network for PCM, and Dual R2R network for DSD! 1: NOS mode , no digital oversampling, the raw data is directly converted to analog. Because digital oversampling will produce time-domain distortions such as ringing, so NOS avoid these problems. Generally NOS mode other performance indicators have a significant impact, but the Spring is designed to allow top performance while in NOS mode. 2: OS mode , the PCM super-sampled PCM higher frequency, the DSD DSD super-sampling to higher frequency, then digital to analog converter. 3: OS PCM mode , enter either PCM or DSD input, all the way to the PCM oversampling analog to digital conversion. 4: OS DSD mode , enter either PCM or DSD input over all sampled DSD approach to digital to analog converter. One of the strong points of the spring is the spatial sounds stage presentation. It’s very wide and precise. Never does it sound congested list many DACs. The high end is very detailed and never harsh sounding. It has the R2R goodness that many have come to know and love. R2R has almost a cult like following and this DAC will surely become a sought after DAC. Everything comes effortlessly for this DAC. Bass is layered and textures, quite full and present without ever masking over the sweet mid tones that are produced. One special thing about the Spring is it’s amazing voltage regulation circuitry that has no more than .2uV noise! This along with the O-core transformer helps regulated the purest power which translates to audio clarity and accurate reproduction. I would say this Spring DAC is better than just about any DAC I’ve ever heard which is saying a lot! Must hear it to appreciate and come to love it’s sound. The Green Label transformer is a step up that brings a new level of clarity not even thought possible. The Red Label already sounds incredible, but if you must have the best and nothing compromised then I would suggest adding the Green Label. Many have asked about how does a discrete resistor network accurately reproduce sound. This email is a good read for those who want a technical explanation on how Jeff was capable of achieving flawless linearity and ultra good specs on THD. This was a reply to a customer who had a technical question about resistors and their limitations. “About the resistor tolerance, his word is partly right, but not accurate. The MSB of 16bits value only represent 32768, not 65536, all 16bits is 65535, but the MSB is only 32768. There are techniques to reduce this requirement. For example, segment+R2R, using segment into the first few bits, then r2r for the rest of them. Rockna is segment+R2R, TotalDAC is all R2R. And you can see, Rockna’s THD spec. is much better than Total. Total uses foil resistor, but they used the simplest architecture. That results an unsatisfied test performance. To my opinion, it’s some kind of wasting foil resistors. Soekris also uses segment+R2R. MSB’s old model is all R2R, but I don’t know about their new models. Anyway, There are ways to improve the performance, the segment+R2R is one way. Trimming is another way. There is an additional R2R ladder in Spring, it compensate the main R2R ladder. It works like trimming, but trimming is to change the resistor value. This additional R2R ladder are digital controlled and is to compensate the resistor tolerance. For example, the msb of 16 bits should have the value of 32768, but due to tolerance, it represent 32700 in real world. Then that additional R2R ladder will compensate 68 into it. Then it became 32700+68=32768. Actually there are other ways to improve performance, I just told you two stories. There are more stories behind the design. It is really hard. I must count every via holes in layout, every PCB wire has it’s impedance and must put attention on it. A via hole can be 50 m Ohm, it is 1/20000 of 1K ohm, and you see, it covers 32768 which is the msb of 16bits. Also the switches has self-impedance which is about several ohms to 30 ohms. If you find this issue. Maybe you will go crazy, it seems to be an impossible mission. But a good designer will overcome all these problems. It’s our value at HOLO Audio. No matter it is a digital switch or analog switch, they are built by transistors, can be either bjt, mosfet or jfet. They have self-impedance call Ron(impedance when at on state). If we expect a lower Ron, the a bigger transistor is needed. But bigger transistor has bigger self-capacitance that will cause switching speed to be lower. So there is no perfect components in the real world. About long term drift, the modern resistor technology has made it much better than older process. But the most important thing is, we don’t care absolute drift, we only care relative drift. That means, if all resistors are drifted in the same direction and same speed. Then it will be no impact for this application. So, we make sure to use the same batch of components in a single board. That will minimize the problem causing by long term drift. As I mentioned in the earlier email. Spring is not using trimming, but using compensation. Not matter it is trimming or compensation, their goal is same, to make the resistance much more accurate so the linearity and distortion can be improved a lot. Also, another customer asking about the oversampling, Jeff replied and has some good information to those who are curious. possible to combine these two modes in one device. Please take a closer look by clicking on the image to open in new window. Take note of the Linearity of this dac. And also take note of the THD level’s being ultra low along with the Signal to Noise Ratio being better than average in general, but remember this is a NOS Dac so it’s actually extremely good and definitely one of the best NOS dac on the market today! SNR - Signal to Noise Ratio - EXCELLENT! Near perfect linearity! Can't really ask for better on this measurement, it's very close to perfect. 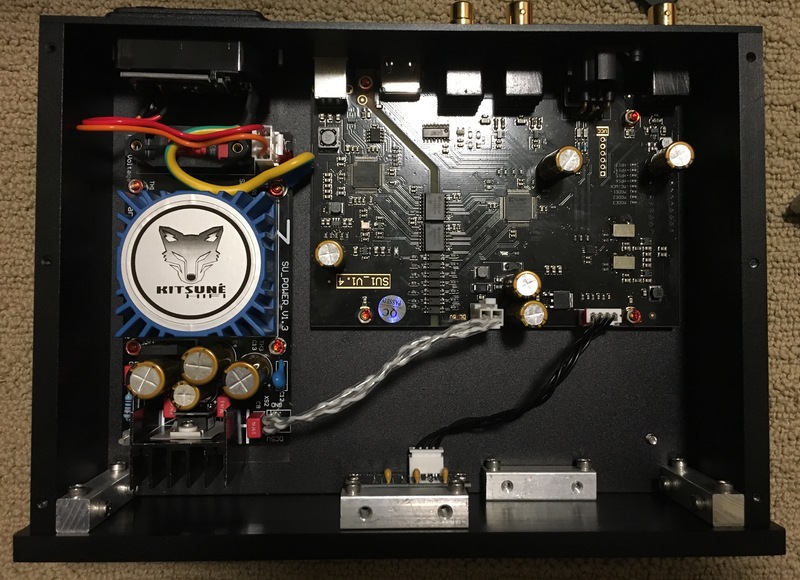 And Jeff Zhu spent immeasurable hours to perfect this dac. no off the shelf USB modules, this one is HOLO audio brand with XMOS. take notice of custom HOLO IC's. R2R - DUAL R2R PCM and DUAL R2R DSD - patented HOLO AUDIO technology of segmenting and trimming together for ultimate precision of audio! This photo shows squarewave NOS vs. Oversampling. take notice of custom HOLO IC’s. no off the shelf USB modules, this one is HOLO audio brand. We now have a working relationship with SingXer (http://www.singxer.com/) from Guangzhou China. We will be carrying several of their products to offer as a local distributor in the USA. Curently we are choosing to offer the Singxer SU-1 and the F1 usb module. We feel these are the best USB options on the market today and proudly will offer these to you at competitive pricing! Sound Electronics Co., Ltd. Guangzhou Shi current office located in a beautiful Panyu District, Guangzhou City. Shi electronic sound team was founded in 2011 , by several team members have many years of experience in the development of audio products, product managers and senior engineers.Since the team was established, within the audio industry to undertake a number of technical development projects, the development team has been the outcome of customer satisfaction and recognition. The company develops high-performance audio products, audio products can undertake OEM, ODM projects. We have a strong development capability in terms of XMOS Audio, pioneered the development of the second generation XMOS xCORE-200 series processors, XMOS Audio optimized many of the underlying firmware. Meanwhile, in the above hardware architecture, there are some technical points independent development. Including the independent development of the system clock, independent development of digital phase-locked loop technology “SHDPLL”, I2S shaping, full isolation technology and so on. and info on the products we carry from Singxer. Singxer’s list of distributors – you’ll find KitsuneHiFi as the ONLY USA distributor. SU-1 digital interface is Singxer team developed a high-performance USB digital audio interface, using the latest XMOS family and Xilinx high-performance CPLD / FPGA chip. SU-1 is the rare use femtosecond system clock digital interface, Crystek of two CCHD-957 SU-1 crystal is the ultimate output audio signal quality has laid a solid foundation. SU-1 digital input interface using a standard USB2.0 interface. 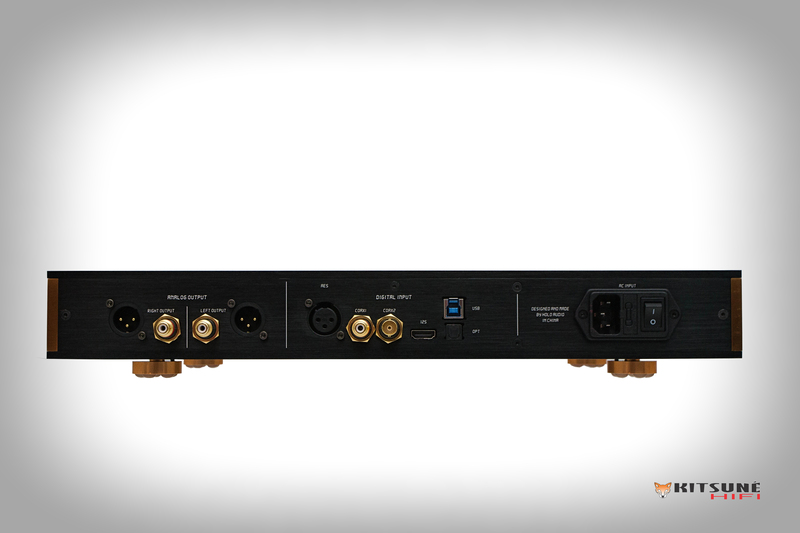 SU-1 has a wealth of output interfaces, including coaxial RCA and BNC output S / PDIF, XLR balanced outputs AES / EBU, HDMI output IIS (including DSD ON and MUTE signals) and BNC WCLK word clock output. 3, the independent development of the system clock, using CRYSTEK high-performance oscillator, low phase noise and low jitter. 1, SU-1 is the first using the XMOS latest xCORE-200 series of high-end USB digital interface products. New generation XMOS chip, using more advanced process technology, performance than the older U8 chip doubled, reaching 1000MIPS processing capabilities. 2 , it is known, the weight of the core is digital audio algorithms. Our team in the field of digital audio work for many years, at the same time get XMOS FAE support team, we conducted a number of technical improvements and optimization algorithms on the basis of the original firmware. 3, the power input is 220V AC, internal use RS importing adapter for power. 1 , carry out electricity as the mother of the acoustic design concept, pay attention to the power supply circuit design, high-performance, low noise and fast response of the LDO as the main power source. The entire board using multiple independent path LDO power supply, wherein the clock even partially adopted ADI ‘s ultra low noise LDO , in order to ensure the ultimate output performance laid a solid foundation. 2 , the PCB motherboard with 4 -layer circuit board design, ensure that you have full power and ground plane layer, using the method of high-speed digital design, signal integrity and power integrity of the entire board. The clock signal for special treatment, using package design and precise impedance control, thereby ensuring the signal quality and increase the clock anti-jamming capability. Input and output signals follow a standard design, especially USB high speed signals using a 90 ohm differential impedance control. 4, Android OS 4.2 and above, the need to support OTG function. 3. The output signal mute, DSD ON signal can be modified according to customer needs, internal CPLD can define different output pins; the two signals can be output to any socket PIN13,14,15,16 pins. F-1 digital interface module, the whole network starting. The first use of the second generation XMOS chip developed high-XU208 USB interface, support firmware upgrade. Self-developed schematics and firmware (including XMOS and CPLD), non-reference design. 3, the independent development of the system clock, using femtosecond CRYSTEK custom clock, ultra-low phase noise, low jitter. F-1 digital interface of our team to develop a high-performance USB digital audio interface, using the XMOS latest xCORE-200 series chips. F-1 is the rare use of ultra- low-jitter femtosecond clock digital system interface. F-1 digital interface using standard USB2.0 input interface, while F-1 has a wealth of output interfaces, including coaxial RCA and I2S interfaces. 1, F-1 is the first using the XMOS latest xCORE-200 series of high-end USB digital interface products.New generation XMOS chip, using more advanced process technology, performance than the older U8 chip doubled, reaching 1000MIPS processing capabilities. Crystal is CRYSTEK CCHD series customized version of the crystal. 1 , carry out electricity as the mother of the acoustic design concept, pay attention to the power supply circuit design, high-performance, low noise and fast response of the LDO as the main power source. The entire board using 2 independent way of LDO power supply, wherein the clock even partially adopted ADI ‘s ultra low noise LDO , in order to ensure the ultimate output performance laid a solid foundation.